The murder of Trayvon Martin has prompted widespread discussions about race in America, persistent inequalities within the criminal justice system, differential values afforded to different bodies, and the real-life consequences of racial stereotypes. Amid many of the discussions, media reports, and the protests have been questions about the racial signifier of the hoodie. From the million hoodie march to the backlash directed at Geraldo Rivera, who named the hoodie as a co-conspirator along with George Zimmerman, the discourse has reflected on the racial signifiers embedded in the hoodie. In other words, how is a black body, inherently criminal and suspect when read within a hoodie; what are the dialects between the hoodie and the black body within these processes of criminalization? These types of questions have been asked and represented in a spectrum of spaces, highlighting the ways the black bodies are imagined as threatening within the dominant white imagination. Pushing the conversation beyond individual prejudice and “what was in George’s heart,” such counternarratives have reflected on how media narratives, popular culture, and a culture that criminalizes black bodies produces a Trayvon Martin, whose mere presence is seen as a threat, all while producing a George Zimmerman. 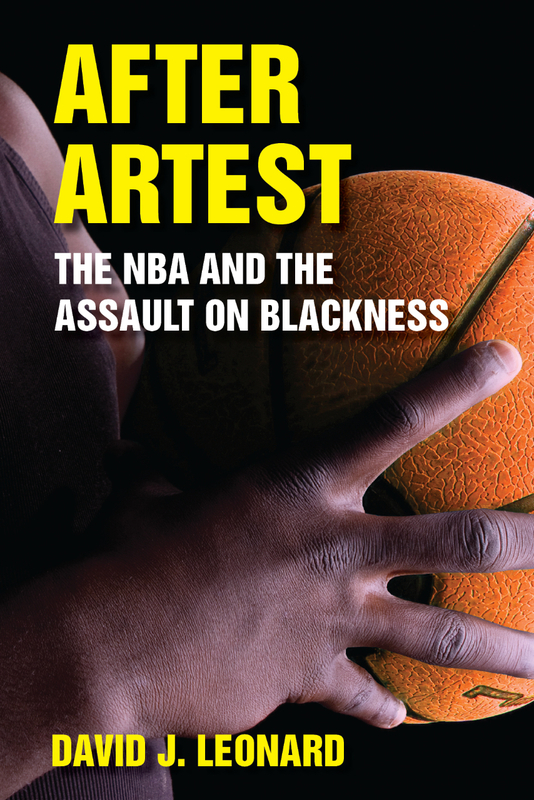 In my recently release book – After Artest: The NBA and the Assault on Blackness (SUNY 2012), I explore the broader criminalization of blackness inside and outside of the NBA’s arenas, that among things has focused on the attitudes, demeanor, and clothing of NBA ballers. I, thus, present to you a short excerpt from the book, one that explores the racialization and criminalization that is evident in the NBA’s dress code as a way to expand our conversation about the murder of Trayvon Martin to reflect on how popular culture, media discourses, and the language of everyday racism both normalizes the criminalization of blackness and points to the importance of intervention in this regard. Continue reading @ NewBlackMan: ‘No [Hoodies] Allowed’: The NBA’s Dress Code & the Politics of New Racism —Excerpt from After Artest: The NBA & the Assault on Blackness. “Trevor Ariza loses shoe, Ron Artest tosses it into the stands” (2009). At first glance, the above headlines point to the fact that Ron Artest’s personal history, and especially his association with the Palace Brawl, continues to determine the public narrative assigned to him by the dominant media and broader public discourse. Even those instances of praise and celebratory redemption does so in relationship to his past indiscretions. Despite the banality of his exchange with Kobe and his tossing of another player’s shoe off the court (his sportsmanship was questioned by an announcer), and notwithstanding his efforts to admit to a past drinking problem1 or shed light on the issue of mental health, each in varying degrees have been the read through the lens of the Palace Brawl. In 2009, Ron Artest admitted to drinking alcohol at halftime while he was a member of the Chicago Bulls. Hoping to teach kids by sharing his past mistakes, Artest’s admission, not surprisingly, prompted much media and public debate. 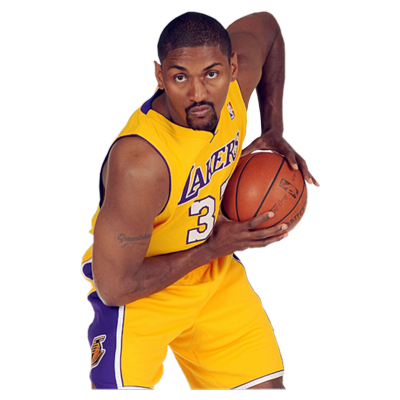 Although some people questioned the truthfulness of his admission, others used this moment as an opportunity to speculate about whether Artest was indeed drunk when he entered the stands in 2004. Likewise, his tossing of Trevor Ariza’s shoe into the stands, along with his physical and verbal altercations with Kobe Bryant, were given amplified meaning and importance considering his role. In all four instances, Artest’s past and his character are used as points of reference. Often invoking his involvement in the 2004 Palace Brawl, the dominant frame that facilitates his representations is not only constrained by Artest’s personal and professional histories, but by the prism of race and blackness. He is consistently imagined as a problem. The nature of these representations point to the ways in which blackness overdetermines not only the meaning of Artest, but of all black NBA players in a post-Brawl context. Post-Artest, blackness is the hegemonic point of reference for both the commentaries and the policy shifts within the NBA, demonstrating that the Palace Brawl changed the racial meaning of the NBA and thus changed the regulatory practices governing the league. . . . . The Palace Brawl was the culmination of the recoloring of the NBA. It represented a moment when the blackness of the league was irrefutable and thus needed to be managed, controlled, and, if necessary, destroyed. After Artest argues that the Palace Brawl served as that “aha moment” in which blackness displaced the racially transcendent signifier of Michael Jordan. This blackness, and its representative threat, were undeniable and, as such, necessitated intervention, termed as an assault within this book’s title. Not surprisingly, anti-black racist/white racial frames have anchored the debates and policies that have followed Artest; frames based on racial transcendence or colorblindness remain in the background. In this sense, Artest mandated a reversal wherein race/blackness had to be noticed (and controlled/destroyed), leading to public articulations of the white racial frame instead of denials of racial significance. With this in mind, it is not surprising that the sports media establishment, and the social media world is all abuzz following a Metta World Peace foul on James Harden on Sunday in a nationally televised game. A hard foul that was reckless and dangerous; one that warranted an injection (unlike others I have no idea his “intent”) and a suspension; and one that was disappointing to say the least and not worry of defense. I am not here to defend the foul or explain, although those who use the foul as a referendum on Metta, the NBA, or blackness need to check themselves. It was unfortunate; yet equally unfortunate and more destructive have been the response. Hayden Kim, on The Bleacher Report, referenced Metta’s “unstable mental stable” and an inability to maintain control; worse yet, he described his outburst in the following way: “As he pounded his chest, acting like a gorilla during mating season, he caught James Harden with an ill-advised elbow that could have caused an earthquake” (the original piece no longer has this language but can still be found here and here). The hyperbole notwithstanding, the descriptor of Metta as a “gorilla” given its historic meaning is disturbing to say the least – disgraceful, in fact. Ken Berger focused more on the typical hyperbole and ‘what ifs” with his discussion of the elbow heard around the world. “Metta World Peace’s vicious, dangerous elbow to the head of James Harden Sunday was no garden variety NBA elbow, and it probably will result in longer than your typical elbowing suspension,” writes Berger. “It should, anyway. This was about as cheap as a cheap shot gets. It’ll have nothing to do with the fact that Metta World Peace is really Ron Artest, he of Malice at the Palace fame. World Peace, after all, has come a long way since his 73-game suspension for going into the stands in Auburn Hills, Mich., in 2004, and even won the NBA’s citizenship award last season (when his name was still Ron Artest).” Berger, unlike so many others notes his recent citizenship award, falls into the trap that he cautions against: reading the incident through the Palace Brawl. Continue reading @NewBlackMan: The Elbow Heard Around the Nation: The NBA and the End of ‘Peace’. On Sunday, amid all the hoopla about the start of NFL training camp, player movement, and the start of the NFL season, Brandon Marshall quietly told the world a secret, announcing that he was living with a Borderline Personality Disorder. Right now today, I am vulnerable, I making myself vulnerable, and I want it to be clear that this is the opposite of damage control. The only reason I am standing here today is to use my story to help others who may suffer from what I suffer from, from what I had to deal with. I can’t explain to you and paint a vivid enough picture for you guys where I been in my life, probably since the end of my rookie year. I haven’t enjoyed not one part of it and it’s hard for me to understand why . . . . One of the things I added to my prayer was for God to show me my purpose here. When I got out of the hospital, I called my videographer and I said, Rob, grab your camera and just come to my house and just start shooting. I said I’m very depressed right now, I probably won’t talk, I probably won’t even leave my theater room, but you just shoot and don’t stop shooting. I said, I don’t know where we’re going with this, I don’t know what’s going to come out of this, but something good is going to happen. Marshall is not the first high-profile African American athlete to publicly document the struggles with mental illness. Several years ago, Ricky Williams spoke about his illness (Social Anxiety Disorder) “to up the awareness and erase the stigma.” Likewise, Ron Artest, who has publicly acknowledged his own disease, has gone beyond chronicling his own story, testifying before congress while raising money (through auctioning off his championship ring) for mental health awareness among youth. Continue reading at NewBlackMan: Brandon Marshall and the Challenge to Mental Health Treatment Inequality. Described as crazy, as a publicity stunt from a man seeking attention, as evidence of his weirdness, and countless other not-to-mentioned racist and derogatory comments, the Internet was set ablaze after Ron Artest announced his plans to change his name to Metta World Peace. – Winning the 2011 J.Walter Kennedy Citizenship award for outstanding service and dedication to the community. – Launching a new reality TV show, “Last Second Shot,” in which he’ll mentor parolees. The one concern I might have for Ron is perhaps appearing like he’s on the verge of jumping the shark. It’s one thing to thank your psychiatrist before conducting a freewheeling, heartfelt press conference for the ages. It’s another to adopt a very unusual moniker. Too many moves at once, however well-intentioned, could come off as cartoonish. The Pali word metta is a multi-significant term meaning loving-kindness, friendliness, goodwill, benevolence, fellowship, amity, concord, inoffensiveness and non-violence. The Pali commentators define metta as the strong wish for the welfare and happiness of others (parahita-parasukha-kamana). Essentially metta is an altruistic attitude of love and friendliness as distinguished from mere amiability based on self-interest. If people could simply hear and practice what is in his name, I can only imagine what the sporting world would look like (not too mention the comment) as well as every other institution within our society.